MEGAN is a modeling system for estimating the emission of gases and aerosols from terrestrial ecosystems into the atmosphere. Driving variables include landcover, weather, and atmospheric chemical composition. MEGAN is a global model with a base resolution of ~ 1 km and so is suitable for regional and global models. 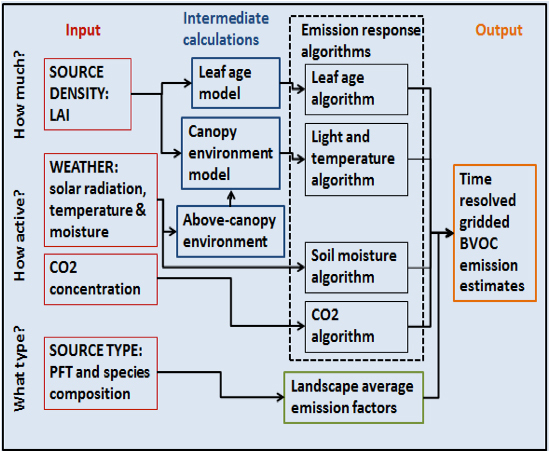 A FORTRAN code is available for generating emission estimates for the CMAQ regional air quality model. The algorithms have also been incorporated as an on-line component in several regional and global chemistry and transport models. Global distributions of landcover variables (Emission Factors, Leaf Area Index, and Plant Functional Types) are available for spatial resolutions ranging from ~ 1 to 100 km and in several formats (ARCGIS, netcdf). Regional distributions are are available at resolutions from 30m to 1000m. It should be noted that running this version of MEGAN requires both access to and knowledge of a Unix operating system and working knowledge of FORTRAN. If you need to regrid the MEGAN input files then you will also need knowledge/access to Python computer language, ESRI ArcMAP software (or some alternative regridding software), FORTRAN. Users who have never been exposed to Unix-type operating systems (i.e., if you are only familiar with Windows) will need to learn Unix to run MEGAN. Although you do not need to be a computer programmer to run the model, you should have a basic understanding of computer programming and Unix (i.e., you should know how to unzip/untar files and other basic commands in Unix, install libraries and link files within Unix, and know basic FORTRAN commands such as how to invoke a code). If you need to regrid landcover data then you should also be familiar with (and have access to) ArcMAP or a similar program. In summary, you should have a working knowledge of ArcMap, Unix, FORTRAN, and Python before attempting to use MEGAN. We have listed links to information and resources in the top left sidebar of this page that we hope will be helpful to those individuals interested in learning more about the tools and programs necessary to run MEGAN. Schematic of MEGAN2.1 model components and driving variables.